When my daughter was about five we took her to the Hirshhorn Museum and Sculpture Garden in Washington, DC. The first piece we happened upon was a large mobile made from dry cleaner hangers. She scrutinized it for a few seconds, declared, “You’ve got to be kidding me,” then turned on her heel and walked off to see what else was on offer. Taking kids to art museums can be fun. Their reactions to the art is spontaneous and unfiltered and they can be receptive to learning about the art if it’s done the right way. Increasingly, art museums are offering resources for families, from scavenger hunts, to online activities to do before or after a visit to family-specific tours and workshops. Here are five U.S. museums you probably want to visit if you haven’t and their exceptional family-friendly offerings. Always check a museum’s website ahead for resources to support your visit and information about free days. And plan to keep visits about the right length for your child’s age and attention span. What’s on offer: This museum in a converted factory offers a sprawling collection (some permanent, much of it rotating) of contemporary art. While we didn’t like everything, we found art that drew us in and amused and baffled us. After exploring, we went to the Kidspace, which usually houses a few pieces of particularly kid-friendly (often interactive) art. When we visited there was a maze kids could walk through and play in. Kids can also ask for one of several art boxes, which contain materials for making art inspired by one of the exhibits you’ve seen. My daughter made trees from corks, beads and pipe cleaners to resemble Natalie Jeremijenko’s “Tree Logic” installation. What’s on offer: The museum has quite a bit for families but its best offer is Art Trek, a tour of the museum recommended for kids 7 to 11 and their parents. On our tour we saw three pieces of art in three distinct parts of the museums. The tour leader was very good at asking questions and getting kids as young as five and as old as 12 to interact with her and think differently about the art. The goal was to find the similarities and differences in art from different periods and places around the globe. If you miss these Saturday tours ask for the family map and family guide to the museum. And before you go, check out MetKids for lots of kid-friendly information and activities. What’s on offer: The museum recently began offering Autism Family Exploration, which allows families with children with autism to explore the museum on Saturday mornings before it opens to the public. There are sensory stops for exploring art in different ways and an all-ability art making experience. For all families there is also the Rosenthal Education Center, where interactive exhibits change twice a year to complement changing exhibitions. It also offers classes and drop-in art-making opportunities. What’s on offer: The one thing kids struggle with at art museums is not touching anything. This isn’t a problem at this museum’s Tactile Gallery. Kids find their way to this sculpture gallery, created for visitors with special needs, and enjoy getting to reach out and touch the contours and textures of the art without anyone stopping them. 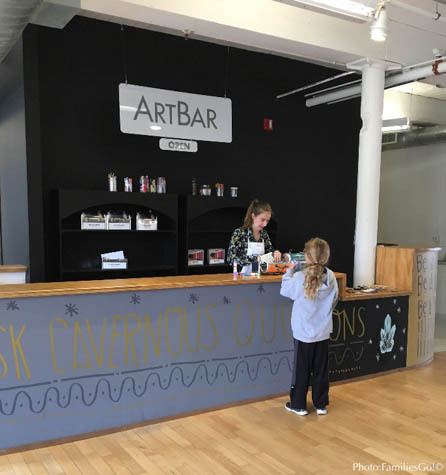 There is also a family theater with a changing roster of shows, one-time and ongoing art classes for parents and kids to take together (including one for military families), two free-admission days every month and a scavenger hunt you can do any time. What’s on offer: Photography is something kids can relate to and it’s eye opening for them to see what you can do with a camera (beyond taking selfies). This small museum creates family guides for each exhibit it stages that are meant to help kids understand and engage with the photography on their level. There is also an annual Family Fun weekend with two days of music, art-related activities and more for both adults and kids. After you’ve explore the museum, head to the museum’s outdoor space with bean bag and birdcage chairs to sit on and grass for running around on. Picnicking is allowed.